Anemia describes the condition in which the number of red blood cells in the blood is low. For this reason, doctors sometimes describe someone with anemia as having a low blood count. A person who has anemia is called anemic. Blood is comprised of two parts: a liquid called the plasma and a cellular part. The cellular part contains several different cell types. 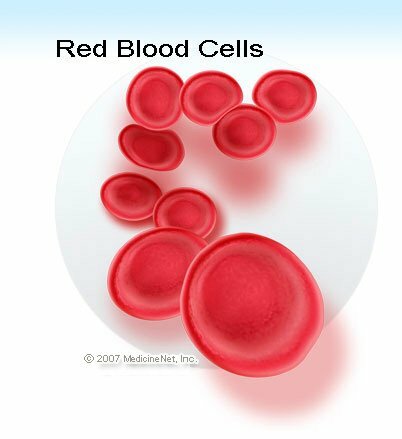 One of the most important and the most numerous cell types are red blood cells. The other cell types are the white blood cells and platelets. Only red blood cells are discussed in this article. The purpose of the red blood cell is to deliver oxygen from the lungs to other parts of the body. Red blood cells are produced through a series of complex and specific steps. They are made in the bone marrow (inner part of the femur and pelvic bones that make most of the cells in the blood), and when all the proper steps in their maturation are complete, they are released into the blood stream. The hemoglobin molecule is the functional unit of the red blood cells and is a complex protein structure that is inside the red blood cells. Contrary to most cells in the human body, red blood cells do not have a nucleus (metabolic center of a cell). Even though the red blood cells (or RBCs) are made within the bone marrow, many other factors are involved in their production. For example, iron is a very important component of the hemoglobin molecule; erythropoietin, a molecule secreted by the kidneys, promotes the formation of red blood cells in the bone marrow. Having the correct number of red blood cells and prevention of anemia requires cooperation among the kidneys, the bone marrow, and nutrients within the body. If the kidneys or bone marrow are not functioning, or the body is poorly nourished, then normal red blood cell count and function may be difficult to maintain. Anemia is actually a sign of a disease process rather than bring a disease itself. It is usually classified as either chronic or acute. Chronic anemia occurs over a long period of time. Acute anemia occurs quickly. Determining whether anemia has been present for a long time or whether it is something new, assists doctors in finding the cause. This also helps predict how severe the symptoms of anemia may be. In chronic anemia, symptoms typically begin slowly and progress gradually; whereas in acute anemia symptoms can be abrupt and more distressing. Red blood cells live about 100 days, so the body is constantly trying to replace them. In adults, red blood cell production occurs in the bone marrow. Doctors try to determine if a low red blood cell count is caused by increased blood loss of red blood cells or from decreased production of them in the bone marrow. Knowing whether the number of white blood cells and/or platelets has changed also helps determine the cause of anemia. In the United States, 2% to 10% of people have anemia. Other countries have even higher rates of anemia. Young women are twice as likely to have anemia than young men because of regular menstrual bleeding. Anemia occurs in both young people and in old people, but anemia in older people is more likely to cause symptoms and be related to serious, underlying conditions. If the red blood cells are smaller than normal, this is called microcytic anemia. The major causes of this type are iron deficiency (low level iron) anemia and thalassemia (inherited disorders of hemoglobin). If the red blood cells size are normal in size (but low in number), this is called normocytic anemia, such as anemia that accompanies chronic disease or anemia related to kidney disease. If red blood cells are larger than normal, then it is called macrocytic anemia. Major causes of this type are pernicious anemia and anemia related to alcoholism. Anemia from active bleeding: Loss of blood through heavy menstrual bleeding or wounds can cause anemia. Gastrointestinal ulcers or cancers such as cancer of the colon may slowly ooze blood and can also cause anemia. Iron deficiency anemia: The bone marrow needs iron to make red blood cells. Iron (Fe) plays an important role in the proper structure of the hemoglobin molecule. If iron intake is limited or inadequate due to poor dietary intake, anemia may occur as a result. This is called iron deficiency anemia. Iron deficiency anemia can also occur when there are stomach ulcers or other sources of slow, chronic bleeding (colon cancer, uterine cancer, intestinal polyps, hemorrhoids, etc). In these kinds of scenarios, because of ongoing, chronic slow blood loss, iron is also lost from the body (as a part of blood) at a higher rate than normal and can result in iron deficiency anemia. Anemia of chronic disease: Any long-term medical condition can lead to anemia. The exact mechanism of this process in unknown, but any long-standing and ongoing medical condition such as a chronic infection or a cancer may cause this type of anemia. Anemia related to kidney disease: The kidneys release a hormone called the erythropoietin that helps the bone marrow make red blood cells. In people with chronic (long-standing) kidney disease (CKD or end stage renal disease (ESRD), the production of this hormone is diminished, and this, in turn, diminishes the production of red blood cells, causing anemia. This is called anemia related to or anemia of chronic kidney disease. Anemia related to pregnancy: Water weight and fluid gain during pregnancy dilutes the blood, which may be reflected as anemia since the relative concentration of red blood cells is lower. Anemia related to poor nutrition: Vitamins and minerals are required to make red blood cells. In addition to iron, vitamin B12 and folate (or folic acid) are required for the proper production of hemoglobin (Hgb). Deficiency in any of these may cause anemia because of inadequate production of red blood cells. Poor dietary intake is an important cause of low folate and low vitamin B12 levels. Strict vegetarians who do not take sufficient vitamins are at risk to develop vitamin B12 deficiency. Pernicious anemia: There also may be a problem in the stomach or the intestines leading to poor absorption of vitamin B12. This may lead to anemia because of vitamin B12 deficiency known as pernicious anemia. Sickle cell anemia: In some individuals, the problem may be related to production of abnormal hemoglobin molecules. In this condition, the hemoglobin problem is qualitative, or functional. Abnormal hemoglobin molecules may cause problems in the integrity of the red blood cell structure and they may become crescent-shaped (sickle cells). There are different types of sickle cell anemia with different severity levels. This is typically hereditary and is more common in those of African, Middle Eastern, and Mediterranean ancestry. People with sickle cell anemia can be diagnosed as early as childhood depending on the severity and symptoms of their disease. Thalassemia: This is another group of hemoglobin-related causes of anemia. There are many types of thalassemia, which vary in severity from mild (thalassemia minor) to severe (thalassemia major). These are also hereditary, but they cause quantitative hemoglobin abnormalities, meaning an insufficient amount of the correct hemoglobin molecules is made. Thalassemia is more common in people from African, Mediterranean, and Southeast Asian ancestries. Alcoholism: Poor nutrition and deficiencies of vitamins and minerals are associated with alcoholism. Alcohol itself may also be toxic to the bone marrow and may slow down the red blood cell production. The combination of these factors may lead to anemia in alcoholics. Bone marrow-related anemia: Anemia may be related to diseases involving the bone marrow. Some blood cancers such as leukemia or lymphomas can alter the production of red blood cells and result in anemia. Other processes may be related to a cancer from another organ spreading to the bone marrow. Aplastic anemia: Occasionally some viral infections may severely affect the bone marrow and significantly diminish production of all blood cells. Chemotherapy (cancer medications) and some other medications may pose the same problems. Hemolytic anemia: The normal red blood cell shape is important for its function. Hemolytic anemia is a type of anemia in which the red blood cells rupture (known as hemolysis) and become dysfunctional. This could happen due to a variety of reasons. Some forms of hemolytic anemia can be hereditary with constant destruction and rapid reproduction of red blood cells (for example, as in hereditary spherocytosis, hereditary elliptocytosis, and glucose-6-phosphate dehydrogenase or G6GD deficiency). This type of destruction may also happen to normal red blood cells in certain conditions, for example, with abnormal heart valves damaging the blood cells or certain medications that disrupt the red blood cell structure. Anemia related to medications: Many common medications can occasionally cause anemia as a side effect in some individuals. The mechanisms by which medications can cause anemia are numerous (hemolysis, bone marrow toxicity) and are specific to the medication. Medications that most frequently cause anemia are chemotherapy drugs used to treat cancers (chemotherapy-induced anemia). Other common medications that can cause anemia include some seizure medications, transplant medications, HIV medications, some malaria medications, some antibiotics (penicillin, chloramphenicol), antifungal medications, and antihistamines. Other less common causes of anemia include thyroid problems, cancers, liver disease, autoimmune diseases (lupus), paroxysmal nocturnal hemoglobinuria (PNH), lead poisoning, AIDS, malaria, viral hepatitis, mononucleosis, parasitic infections (hookworm), bleeding disorders, and insecticide exposure. It is noteworthy that there are many other potential causes of anemia that are not included in this list as these are only some of the more common and important ones. Because a low red blood cell count decreases oxygen delivery to every tissue in the body, anemia can cause a variety of signs and symptoms. It can also worsen the symptoms of almost any other underlying medical condition. If anemia is mild, it may not cause any symptoms. If anemia is slowly ongoing (chronic), the body may adapt and compensate for the change; in this case there may not be any symptoms until the anemia becomes more severe. enlargement of the spleen with certain causes of anemia. Because anemia is typically a clue to another underlying disease, it needs to be fully evaluated by a doctor, and proper testing needs to be undertaken to determine the cause. Therefore, if signs and symptoms of anemia are present, one should contact his or her physician for evaluation. In the elderly and people with chronic medical conditions, such as heart disease or lung disease, the symptoms of anemia may be more significant, and a prompt medical evaluation is prudent. The diagnosis of anemia at home is difficult unless bleeding is obvious. If significant bleeding is clearly evident, as in a severe injury, immediate medical attention is required and one should consider going to the emergency room. Generally, this kind of acute (short onset) anemia is more likely to cause immediate symptoms than chronic (long-lasting) types of anemia. Many individuals with chronic conditions, such as sickle cell anemia, know when they have an attack related to their disease (sickle cell crisis) and opt to seek medical attention promptly. Doctors can easily detect anemia by drawing a blood sample for a complete blood count. Based on the results of the test and thorough evaluation of the patient, the doctor may order more tests to determine the exact cause of anemia. The complete blood count may be done as part of a routine general check-up or based upon the presence of signs and symptoms suggestive of anemia. Physical examination and medical history also play a crucial role in diagnosing causes of anemia. Some of the important features in medical history cover questions about family history, previous personal history of anemia or other chronic conditions, medications, color of stool and urine, bleeding problems, and occupation and social habits (such as alcohol intake). While performing a complete physical examination, the physician may particularly focus on general appearance (signs of fatigue, paleness), jaundice (yellow skin and eyes), paleness of the nail beds, enlarged spleen (splenomegaly) or liver (hepatomegaly), heart sounds, and lymph nodes. Because anemia is only a symptom of another disease, doctors will want to determine what condition is causing the anemia. Some people may need many additional tests, and others may need very few. For example, an anemic person with known stomach ulcers typically would not need multiple blood tests, but may need to have his or her stomach visually evaluated and have the ulcers treated. On the other hand, a person with a family history of anemia and without an obvious source of blood loss may need multiple laboratory blood tests and other types of diagnostic evaluation. Doctors also take into consideration the severity of the anemia when deciding what tests to order. When a person has severe anemia, the cause must be determined rapidly so that it can be treated appropriately. Complete blood count (CBC): Determines the severity and type of anemia (microcytic anemia or small-sized red blood cells, normocytic anemia or normal-sized red blood cells, or macrocytic anemia or large-sized red blood cells) and is typically the first test ordered. Information about other blood cells (white cells and platelets) is also included in the CBC report. Hemoglobin (Hgb) and hematocrit (Hct) measurements in a complete blood count test are commonly used to diagnose anemia. They measure the amount of hemoglobin, which an accurate reflection of red blood cell (RBC) quantity in the blood. 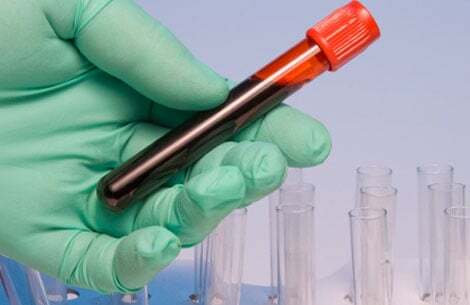 Stool hemoglobin test: Tests for blood in the stool may detect bleeding from the stomach or the intestines (stool Guaiac test or stool occult blood test). Peripheral blood smear: Looks at the red blood cells under a microscope to determine the size, shape, number, and appearance as well as evaluate other cells in the blood. Iron level: A serum iron level may tell the doctor whether anemia may be related to iron deficiency or not. This test is usually accompanied by other tests that measure the body's iron storage capacity, such as transferrin level and ferritin level. Transferrin level: Evaluates a protein that transports iron in the body. Ferritin: Evaluates at the total iron available in the body. Folate: A vitamin needed to produce red blood cells, which is low in people with poor eating habits. Vitamin B12: A vitamin needed to produce red blood cells and low in people with poor eating habits or in pernicious anemia. Bilirubin: Useful to determine if the red blood cells are being destroyed within the body which may be a sign of hemolytic anemia. Lead level: Lead toxicity was formerly one of the more common causes of anemia in children. Hemoglobin electrophoresis: Sometimes used when a person has a family history of anemia; this test provides information on sickle cell anemia or thalassemia. Liver function tests: A common test to determine how the liver is working, which may give a clue to other underlying disease causing anemia. Kidney function test: A test that is very routine and can help determine whether any kidney dysfunction exists. Kidney failure can result in erythropoietin (Epo) deficiency, leading to anemia. Bone marrow biopsy: Evaluates production of red blood cells and may be done when a bone marrow problem is suspected. Very little can be done to self-treat anemia and medical treatment is generally needed. It is important to continue to take any medication that is prescribed for other chronic (long-lasting) medical problems. If the reason for anemia is known, then measures to keep it under control are very important. For example, if anemia is caused by a stomach ulcer, then medications such as aspirin or ibuprofen should be avoided, unless otherwise directed by a doctor. Medical treatment of anemia varies widely and depends on the cause and the severity of anemia. If anemia is mild and associated with no symptoms or minimal symptoms, a thorough investigation by a doctor will be done in the outpatient setting (doctor's office). If any cause is found, then appropriate treatment will be started. For example, if anemia is mild and is found to be related to low iron levels, then iron supplements may be given while further investigation to determine the cause of the iron deficiency is carried out. On the other hand, if anemia is related to sudden blood loss from an injury or a rapidly bleeding stomach ulcer, then hospitalization and transfusion of red blood cells may be required to relieve the symptoms and replace the lost blood. Further measures to control the bleeding may occur at the same time to stop further blood loss. Blood transfusion may be required in other less critical circumstances as well. For example, an individual who is receiving chemotherapy for a cancer may be expected by the treating physician to have bone marrow problems related to the chemotherapy. Therefore, the doctor may check blood counts routinely, and if the levels get to a low enough level, he or she may order a red blood cell transfusion to help with the symptoms of anemia. Iron may be taken during pregnancy and when iron levels are low. It is important to determine the cause of iron deficiency and treat it properly. Vitamin supplements may replace folate and vitamin B12 in people with poor eating habits. In people with pernicious anemia who are unable to absorb sufficient amounts of vitamin B12, monthly injections of vitamin B12 are commonly used to replete the vitamin B 12 levels and correct the anemia. Epoetin alfa (Procrit or Epogen) is a medication that can be given as an injection to increase red blood cell production in people with kidney problems. The production of erythropoietin is reduced in people with advanced kidney disease, as described earlier. Stopping a medication that may be the cause of anemia may also reverse anemia after consultation with a physician. If alcohol is the cause of anemia, then in addition to taking vitamins and maintaining adequate nutrition, alcohol consumption needs to be stopped. There are no specific surgical interventions for the treatment of anemia. However, depending on the causes of the anemia, surgery may be a treatment option. For example, if colon cancer or uterine cancer that slowly bleeds is the cause of anemia, then surgical removal of the cancer could potentially treat the anemia. Follow-up care for anemia will depend on its type. Most will require repeat blood counts. Also, repeat visits to the doctor's office are generally recommended in order to determine the response to treatment. Some common forms of anemia are most easily prevented by eating a healthy diet and limiting alcohol use. Many types of anemia can be avoided by seeing a doctor regularly to check blood tests and when problems arise. In the elderly, routine blood work ordered by the doctor, even if there are no symptoms, may detect anemia and prompt the doctor to look for the underlying causes. How well someone with anemia will recover depends on the cause of the anemia and how severe it is. For example, if a stomach ulcer is causing anemia because of bleeding then the anemia can be cured if the ulcer is treated and the bleeding stops. If anemia is caused by kidney failure, however, then it most likely will require long-term monitoring and treatment. In general, young people recover from anemia more quickly than older people do. Younger people also tolerate symptoms of anemia better than elderly people. Effects of anemia on elderly people tend to be more significant because of more underlying chronic medical problems. Anemia makes almost any medical problem worse. What treatment has been effective for your anemia? Tell us about your experience with anemia.